Vegan dining has a gender bias, clearly. There are way more girls than boys at the all-vegan Paperbark in Waterloo. Whether that worries any blokes out there (uh oh, girly food), depends on where you park your concept of masculinity. Mine is flexible, driven by greed and self-interest. You have to have some guiding principles in your life. Besides, this is next-level vegan: balanced, punchy, crunchy and actually built on the inherent beauty of vegetables, with Indigenous ingredients adding colour, contrast and character. 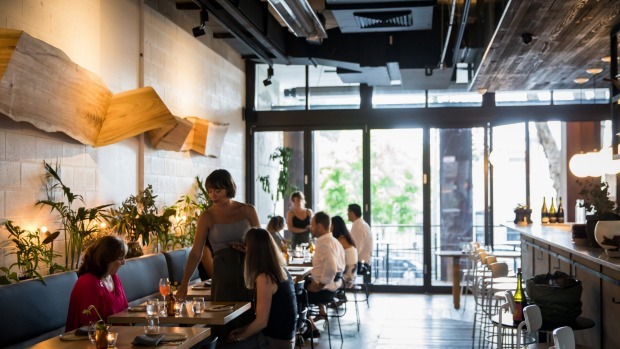 A co-production of the unstoppable Grace Watson and Joe Pagliaro of plant-based restaurant group Verd, and Joey Astorga​ and Hellene Algie of the Alfie's Kitchen pop-ups, Paperbark landed in Waterloo's Casba precinct last June. There's an almost beach-house feel to the dog-leg space with its recycled timbers, whitewashed walls, rampant greenery, back-wall banquette, and the striking, sprawling wooden sculpture across one wall. 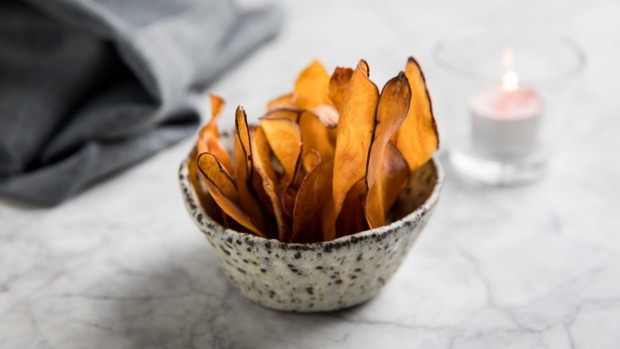 Bread is Iggy's, and bar snacks are moreish, from a mad frizz of crisp chips poking out of a smoky eggplant and pepperberry dip to salt and vinegar churros, fashioned from mashed and roasted potato, and topped with freeze-dried sherry vinegar, aioli and sea blight. 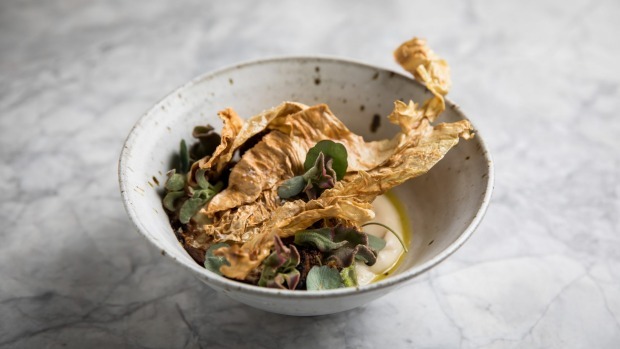 Astorga and his kitchen team, Lucy Holm, Meisha Gerrand and Victoria Scriven, build in richness through infused olive oils, and layer in umami through slow-roasting, marinating and fermenting, always pulling things back into balance with acidity. Beetroot is practically caramelised, laid over a lovely lemon aspen cream and scattered with ice plant and sea blight for a sea-salty crunch. The Insta-princess dish of organic mushrooms skewered onto twigs, charred over paperbark and served with macadamia cream, is utterly delicious. When you're working with a limited playbook, produce is key. Charred roasted cauliflower on a bed of cauliflower cream under a camouflage of cabbage "crackling" and grilled radicchio makes a hero of the excellent organic produce of Greg Kocanda's Block 11 Organics (available from Carriageworks and French's Forest farmers' markets). 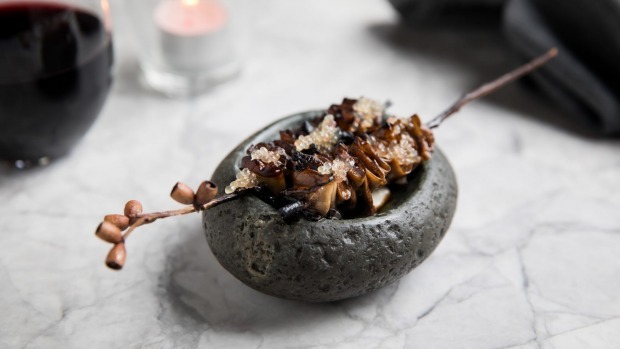 Over the flow of a set menu, the closest thing to a traditional main course is "leek, oyster mushroom and Davidson's plum"; the barbecued oyster mushrooms, paperbark-charred leeks and fleshy beach bananas perched on a hearty potato mash. It would be bland but for the sourness of the plum and a grippy, challenging strawberry gum oil that shoves home the natural astringency of Australia's native ingredients. Wines are 100 per cent #nonasties, a catholic all-vegan bunch of orange skin-contact wines, varietals and wacky red/white blends that are like nothing you've drunk before. The all-woman floor team headed by Algie is highly engaged and persuasive, loving it when you go for the "out-there" option. An organic, whole-bunch Strenua Syrah from the Yarra Valley's Chum Creek ($80) is relatively straight, as black-olive and savoury as you'd want. And thank you, oh gods of veganity, for not going all raw coconut oil on us at dessert time. 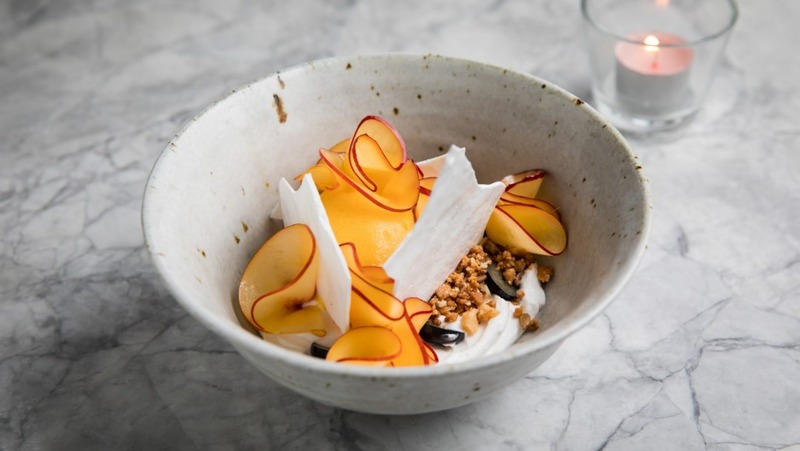 Instead, there are "meringue" shards of dehydrated aquafaba made with the soaking water of chickpeas and sugar, not eggs, to add a pavvy crunch to furls of nectarine, lemon myrtle cream, mango mousse, macadamia crumbs and blueberries ($17). This is the vegan dining we've been waiting for – clever, delicious and with purpose. Could it be the only reason there are more women than men here is because they're smarter? Vegetarian 100 per cent vegan across bar menu and set menus. Drinks 100 per cent vegan wine list; cocktails made with all-Australian spirits, Wildflower 750ml "big beers" and kombucha spritzes. Go-to dish Paperbark mushrooms, macadamia, finger lime, $9. Pro tip If it's a warm night, nab a romantic table on the front balcony.